Almost 1,000 households have already had their benefits capped in Scotland since the introduction of benefit changes, official figures show. A £26,000 cap on working age benefits came into force in England, Scotland and Wales earlier this year. The Department for Work and Pensions said the measures had been applied to 977 Scottish households between 15 April 2013 and October 2013. Opponents say the cap does not address underlying issues for claimants. UK Work and Pensions Secretary Iain Duncan Smith said: "These figures highlight our commitment to support those who want to work hard and get on and to end benefit dependency. "We had to fix the broken welfare system. The benefit cap means claimants no longer receive more in benefits than hard-working households' average earnings and Universal Credit ensures being in work pays; making the welfare system fair for claimants and the taxpayer that funds it." The benefit cap applies to combined income from the main out-of-work benefits, with exemptions for some disability and attendance allowances. 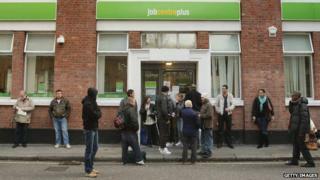 Jobcentre Plus teams have also been tasked to help capped claimants into work. Critics say the cap fails to tackle underlying issues, such as the difficulty of finding work, the cost of housing and regional differences. The Scottish government said benefit cuts were "making life tougher for ordinary families". A spokesman said: "While the Scottish government supports measures to get people into work and out of poverty, evidence shows that tens of thousands of households are affected by UK welfare reforms, including the bedroom tax. "We are also not seeing signs that Westminster actions, like the Work Programme, are helping Scots get back into work." 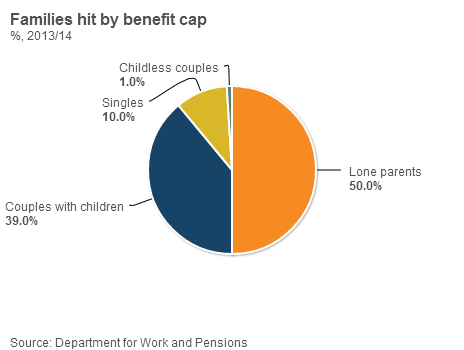 A total of 28,500 UK households had their benefits capped by October 2013, according to the DWP. About 3.5% of capped claimants were in Scotland. Nearly a fifth of capped claimants in Scotland were from Edinburgh - 187 from 997, followed by Glasgow with 153, while Fife had 73 capped claimants. Dundee City had 46, the same as South Lanarkshire, while Clackmannanshire was also high on the list with 40 - the same number of capped claimants as West Lothian.